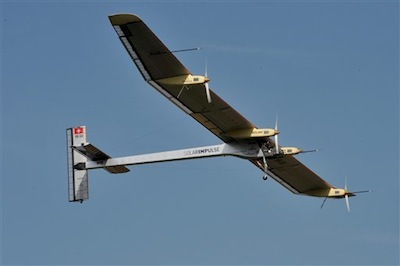 The solar powered aircraft "Solar Impulse" (HB-SIA prototype) flew for the first time on Wednesday, April 7. Test pilot Markus Scherdel took Solar Impulse aloft from the military airport in Payerne, Switzerland. The prototype aircraft is made of lightweight materials, weighing only 3,500 pounds and it has a wingspan of 210 feet. It is powered entirely by the 11,000 solar cells covering its wings. "There has never been an airplane of that kind that could fly — never an airplane so big, so light, using so little energy," said Swiss adventurer Bertrand Piccard, who in 1999 copiloted the first nonstop round-the-globe balloon flight. "So there were huge question marks for us." At a military airport in the Swiss countryside, the plane lifted off after at a speed no faster than 45 kph (28 mph) after only a short acceleration on the runway. It slowly gained altitude above the green and beige fields, and disappeared eventually into the horizon as villagers watched from the nearest hills.